A man and woman on a train journey are exchanging notes about that one grand obsession in their lives. She is Shaina Mehra (Jacqueline Fernandez), daughter of the Indian ambassador to Poland. He is Himanshu Tyagi (Randeep Hooda), a top Indian policeman. Shaina tells him about her ex-boyfriend Devi Lal Singh back in Delhi, an altruistic fellow who was forever placing himself in precarious situations to get an adrenaline rush (he calls it “kick”, hence the film’s title). Since he was unable to stick to any job, her father assumed that he would gladly be a ghar jamaai. Whaaaaatttttt?!!!! I tell ya, the audacity of the man! Since there can be no greater affront to a Bollywood hero’s ego – as we all know – this GJ business ultimately tears the couple apart. Himanshu in turn tells Shaina about the one criminal he has failed to nab so far – a gravity-defying, logic-busting, masked thief whose face no one has ever seen. He calls himself Devil. Of course they’re both talking about the same man, played by Salman Khan. Don’t worry, that’s not a spoiler: they don’t know, but we the viewers are in on the secret from the start. Producer Sajid Nadiadwala’s debut film as director, Kick is devoted to dual threads: the crests and troughs of Devi’s romance with Shaina, and Himanshu’s cross-continental chase of Devil. That the two stories will intersect at some point is evident from the word go. Kick is a glossy, overtly expensive film shot in India and abroad with sumptuous sets and expansive cinematography. Although Ahmed Khan’s choreography for the women (Jacqueline and cameo girl Nargis Fakhri) is graceless, he has given Salman some interesting moves. The intermittent humour in the screenplay steers clear of farts, poop and pee, which is more than can be said of most big Bollywood comedies these days. Besides, although it has been designed as an ode to its leading man replete with references to his hits, it is less irritatingly in-your-face with the Salman worship than many of the star’s recent films. Big mistake though: Sajid surrounds his hero with supporting actors so vastly superior to him in various ways, that they show him up for what he is: a cute guy with a charming screen presence who milks the cuteness and charm to camouflage his limited acting. Mistake #1: casting Nawazuddin Siddiqui as Devil’s bête noir. The eccentric Shiv Gajra in Kick is the least nuanced character this marvelous actor has played so far. Yet, Nawaz shows flashes of brilliance even here. The merit in his performance becomes glaring when Devil/Salman mimics Shiv’s quirks, and falls flat in the attempt. Mistake #2: casting Randeep Hooda as Himanshu. Randeep is an underrated actor who is his usual, quietly effective self in Kick, but that’s not the point here. His presence in this film serves to highlight the fact that Salman is no longer the lithe action hero he once was. This Khan has always had the body and distinctive walk of a body-builder – I get that. But from Ek Tha Tiger onwards, he has been looking increasingly tubby and sluggish. Watching one particular low-angle shot of him negotiate the edge of a wall of a high-rise building is a sad reminder of this. So too is the sight of him next to Randeep’s slim yet muscular frame sans the endearing Salman-deprecating humour of Dabangg’s screenplay that revelled in the physical differences between Chulbul Pandey (Salman) and Chhedi Singh (played by the towering Sonu Sood). It doesn’t help that a light-footed Hrithik Roshan as another masked hero is still so fresh in our memories. Mistake #3: Vipin Sharma playing India’s Home Minister and Sanjay Mishra as the low-ranking policeman Ramaavtar Rathi pull off comedy with greater panache in their brief appearances in Kick, than Salman manages with the zillion lines he gets in the entire film. The film’s gender politics is steeped in hypocrisy. In one scene, Devi bashes up a bunch of guys who were harassing women at a restaurant and lectures the indifferent onlookers. This comes just seconds after he was himself harassing Shaina in that very restaurant despite her professed disinterest. Then in that thoroughly enjoyable song Jumme ki raat hai (the stand-out number in an otherwise lacklustre soundtrack), Devi lifts an unsuspecting Shaina’s skirt by his teeth and follows her, surrounded by a troupe of male dancers. In the same song, she takes off her overcoat and gyrates every single part of her body in a tiny tight dress, while he watches in open-mouthed wonderment. In the very next shot he protectively covers up her body with her coat. Guess he just remembered those audience members who were moved by his earlier ma-behen speech? To be fair, there are several scenes in which the humour hits home and the action is cool (one involves Devil on a bike with a speeding train approaching him). For the most part though, Kick feels stale. In places, the writing is so sub-standard that it’s a wonder such lines were released for public consumption. Topping the list is the repeated, tacky use of the word “kick” in dialogues to justify the contrived title. The characterisation of Devi’s mother (over-acted by Archana Puran Singh) is unimaginative and unoriginal. How many times will we be served loud, crude melodramatic North Indian moms before the cliché is laid to rest? As Devi’s dad, Mithun Chakraborty delivers an OTT performance of an unfunny, OTT character. 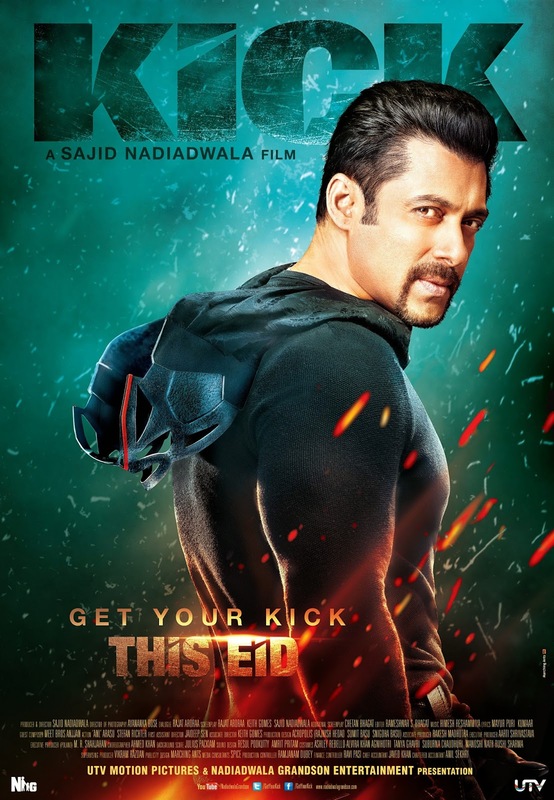 Kick is a remake of a Telugu film of the same name, with a screenplay adapted for Bollywood by Nadiadwala, Rajat Aroraa and bestselling author Chetan Bhagat. The result of Bhagat’s earlier screenplay collaboration was Kai Po Che, a film that is head and shoulders, eyebrows and forehead above this one in terms of finesse and novelty. This is not to say that Kick can be completely written off. It’s way better than the recent Salman-starrer Jai Ho. But considering the dullness of Jai Ho and how repetitive Salman has been since the highly entertaining Dabangg in 2010, that still just makes Kick an average film with sporadic humour and little that’s new. Footnote: Believe it or not, Salman plays a 40-year-old in Kick. Devi laughingly claims that he is 10 since his birthday comes once every four years (he was born on February 29 in a leap year). As every Bollywood buff knows, for a 48-year-old male star to play a 40-year-old character, and not a 20-/30-something, is unusual and progressive. Next step hopefully: 48-year-old men who do not insist on starring opposite girls two decades their junior? Nawazuddin Siddiqui as the villain was an excellent move. He is way too talented. Randeep was excellent too. Salman as usual and it should not be mentioned, was his usual best. Yes Salman played a 40 year old character just like how SRK played a 40 year old character last year. SRK was 48 years old last year too. So if it was not a big deal then then it shouldnt be a big deal now either. Movie deserves at least 4 stars. Not sure what you were smoking while watching the movie. Loved your review! It's time Salman retired! He should become a gym instructor! SRK wasn't playing an action hero in it. I think you're a salman fan, they always find a way to bring srk up to justify their points - why? I hated the movie.shameful ,how these movie stars are still accepted .they should be banned to act.I agree he might do a better job as a gym instructor. loved the review. there is nothing shameful about these movies. These stars are loved and they will phase out, may be slower than others but they will definitely phase out. Till then, just relax, enjoy and comment. I like it when people like to critize films like as if they can make a better film. First try to make yourself look good in front of the camera. It is easy to trash film. Anyone can do it. Try and make a film. The movie was very good. Everyone has their opinion. The film is making average collections. 130cr after 5 days is not that bad. Well some actors are just too big to be pulled down by critics. Salman is the only actor to have 7 back to back 100cr collections and 6 blockbusters in 4 years.